As mentioned before, we filled our blog so I am a bit behind. Looking at photos from last week, the first photo I want to post is from last Thursday. The weather was wild and wet, but I have found somewhere to take both small and older children that I think is both fantastic and overlooked (ie not as nightmarishly busy as the Science Museum or the Natural History Museum). The Museum of London, in the City just near the St Paul’s tube station. While most of their weekend family events are for children over 5 years’ old, on Wednesday’s they have activities for the under 5’s, including during the term breaks. Its actually really difficult to find somewhere that is both indoors and suitable for small children. Anyway, my favourite galleries were those covering the periods of 1666-1850’s and also 1850’s-1940’s. A fascinating time in London’s history, and its both entertainingly and informatively presented at the Museum. For example – there are several boxes set within a wall where children (and adults) can put their hands in and feel keys, handcuffs, chains etc from an old prison. There are many other interactive exhibits that I won’t bore you with, but I think its a tremendous museum and I highly recommend it for children of any age, as well as for adults. I can’t think of anywhere else, apart from the Science Museum, where we have been able to let the girls run around touching exhibits so freely. Late 18th century pleasure gardens, full of period costumes and specially commissioned masks and hats by Philip Treacy. Back to what I was wearing. As you can see, I was carrying a breadstick as I took this photo while getting the girls ready. 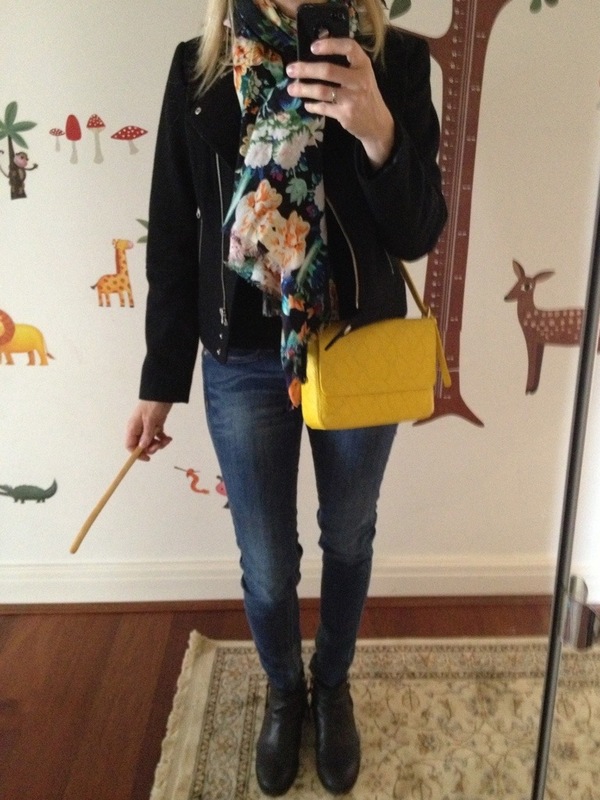 Apart from the breadstick, I was also adorned with a Zara floral silk/cotton scarf, H&M black wool mix biker jacket, & Other Stories Clare Vivier yellow leather bag, Mango Kate skinny jeans & Kurt Geiger black Willow ankle boots. You are my sunshine, my only sunshine… Actually, not for long – the weather forecast says real, genuine sunshine is on its way! This entry was posted in Children, Outfits and tagged & Other Stories, Clare Vivier, H&M, Kurt Geiger, Mango, Museum of London, Zara on April 22, 2013 by Belinda WornOut.